Discover our different pluripotent stem cell workflows and find the one that fits your experimental needs. High-quality human pluripotent stem cell (PSC) lines are the foundation of any successful and reproducible PSC research. Choosing the right cell culture conditions is critical when expanding, passaging, or cryopreserving PSCs. Therefore, we have developed the reliable xeno- and serum-free StemMACS Culture System that is available up to MACS GMP-grade. Pluripotent stem cell lines cultured in StemMACS iPS-Brew XF show a typical pluripotent morphology and surface phenotype. 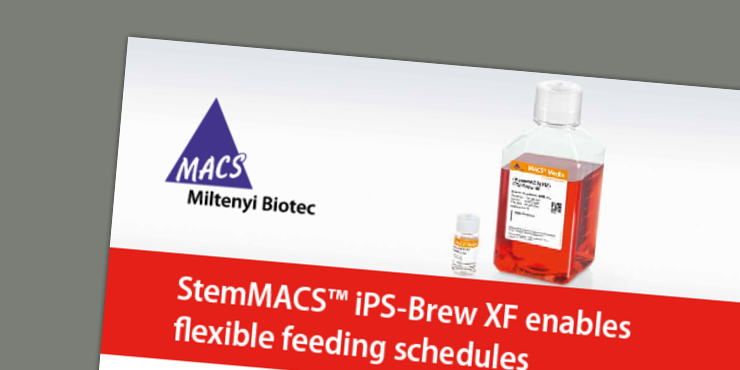 In this application note we show that StemMACS iPS-Brew XF enables more flexible feeding schedules, including the possibility of skipping one or even two feeding days, while reliably maintaining PSC cultures. Regardless of the feeding schedule, PSCs retain a characteristic colony morphology, high expansion rates, and high expression levels of pluripotency markers throughout five consecutive passages. See which method we recommend for passaging pluripotent stem cells cultured in StemMACS iPS-Brew XF. 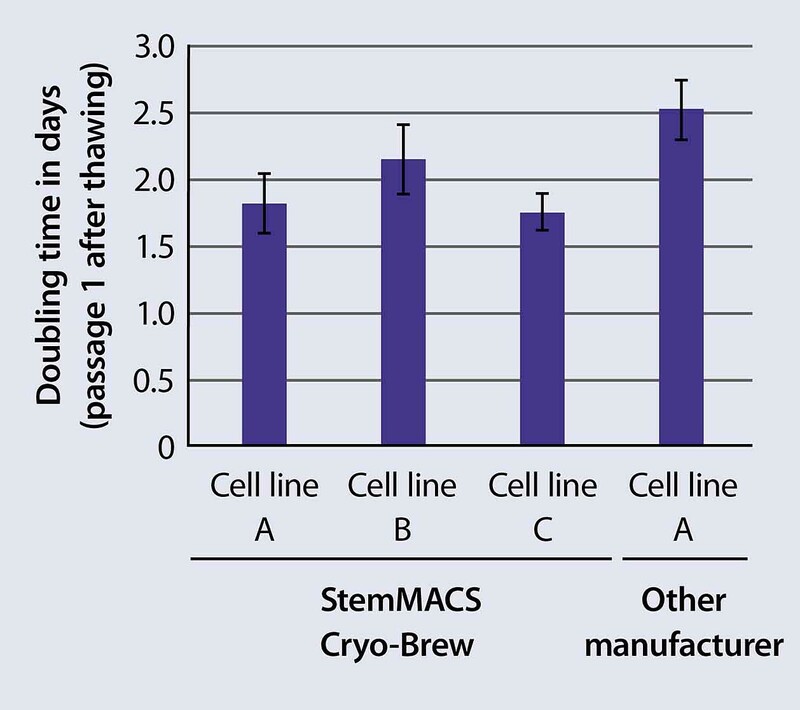 StemMACS Cryo-Brew ensures high recovery, viability, and genetic stability after cryopreservation of PSCs. determine the genomic stability of iPSCs cryopreserved in our medium, we analyzed the karyotype in passage 5 post-thaw (n=2, example shown for cell line B) (C). This application note describes a multicolor flow cytometry protocol that allows for the simultaneous quantification of intracellular and surfacemarkers for easy monitoring of the pluripotency status of human PSC cultures. Four different iPSC lines were differentiated into ectoderm, mesoderm, and endoderm using the StemMACS Trilineage Differentiation Kit. 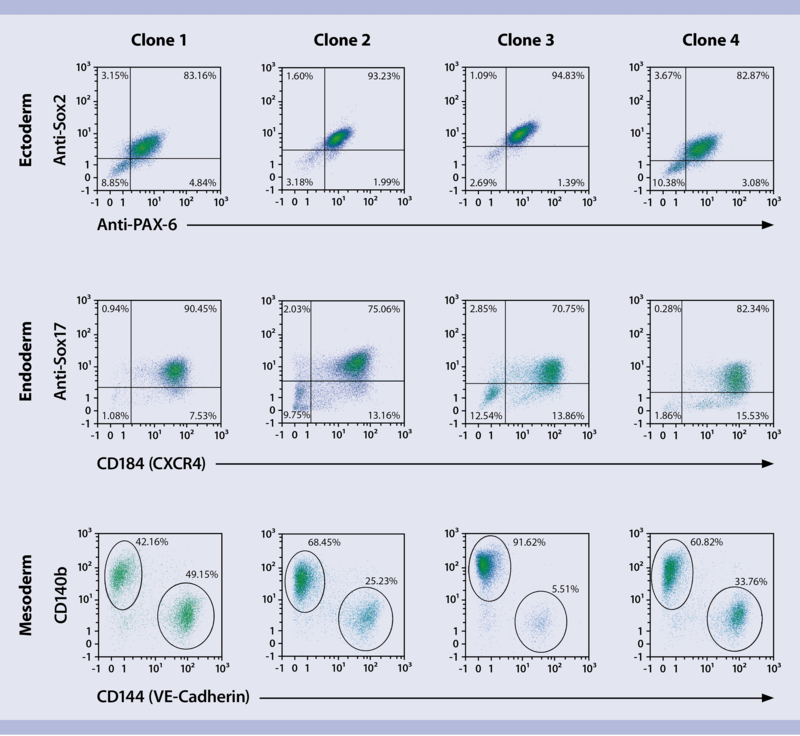 On day 7, the differentiation cultures were analyzed by flow cytometry. While all lines showed pluripotent differentiation potential, the assay also revealed differences in their propensity to differentiate into certain lineages, e.g. CXCR4+Sox17+ definitive endoderm cells. Four different iPSC lines were differentiated into ectoderm, mesoderm, and endoderm using the StemMACS Trilineage Differentiation Kit, human. On day 7, the differentiation cultures were analyzed by flow cytometry. While all lines showed pluripotent differentiation potential, the assay also revealed differences in their potential to differentiate into certain lineages, e.g. CXCR4+Sox17+ definitive endoderm cells.